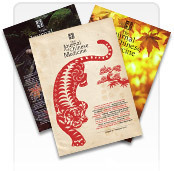 This section of The Journal of Chinese Medicine website is devoted to the accumulation of case histories - acupuncture, herbal medicine, qigong etc. for mutual education and reference. Anyone can send case histories for adding to this section.We would suggest that the most valuable kinds of cases would be unusual or difficult diseases, unusual treatments or outcomes, or any case where there might be something of special interest and value to other practitioners. They do not all have to be successful cases! Indeed, some of the most useful case histories can be failures where something valuable has been learnt. The treatment approaches can be as varied as practitioners are - there is no orthodoxy here. They do not have to be beautifully written (though of course they can be). The main thing is that they have sufficient information to show the treatment approach, treatment and outcome. I hope that in this way we can all contribute to a resource that will eventually be a wide and valuable source of reference material. Note: these case histories have not been edited by us. Some have been written by practitioners for whom English is not a first language. Some are in note form. We have included the email address of the practitioner if you wish to respond directly. In order to contribute, just send your case history to peter@jcm.co.uk with "Case History" in the subject field.